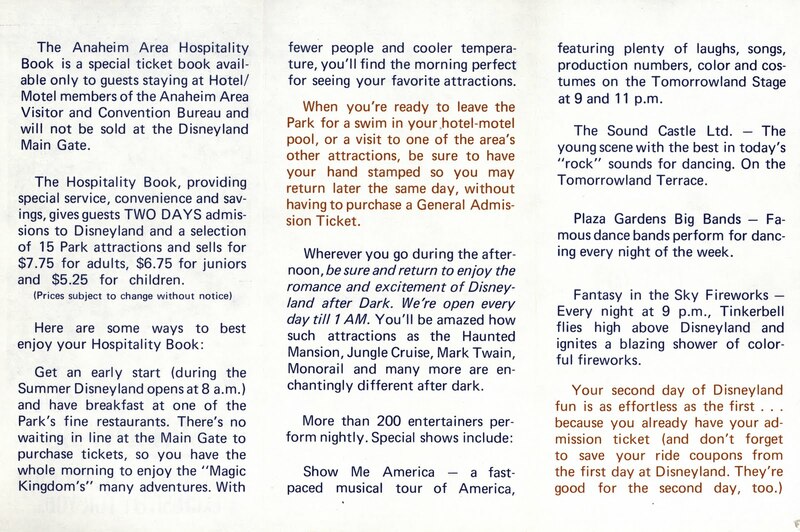 Time for another look at Disneyland's Hospitality ticket books. Be sure and checkout my previous post (link). 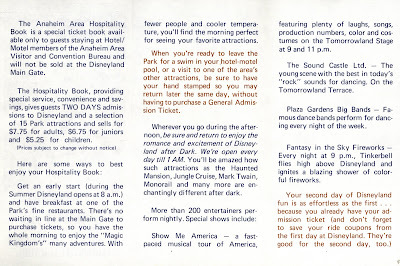 This little brochure is undated, based on the ticket book price and a few other clues I would place this from 1970. How cool is that illustration? Note the dad with his baby in his arms in a baby holder – no stroller in sight! The side flap has this awesome graphic. The Sound Castle Ltd., and Show Me America, it’s got to be 1970 – Groovy! 7 hours each day to clean the park for the entire summer. Here’s the back of a 1969 Hospitality book, I like mom’s hair style. Cool... that Mickey/ghost graphic is the same one used on a 1970 Navy Nite flyer that I posted a while ago!